It certainly has been an exciting couple of weeks to open up this regular season in baseball. As always, the opening weeks have raised eyebrows and definitely raised some questions. Rest assured, the best and worst teams in April are most likely not going to be the best and worst teams in September, but it’s fun to rank them anyway. I’ve been ranking the teams all season, but the site has only been up for a few days, so the teams will be moving up or down according to where I’ve had them in my personal power rankings. Biggest Jump: Pittsburgh Pirates (8-2) They jump up from 18 to 10 this week after continuing their hot streak. Their Team batting average of .286 is tied with the Angels for highest in the league and they are second only to the Angels in runs scored with 66. Not bad for a team that I completely expected to lose 100 games after trading Andrew McCutchen and Gerrit Cole in the offseason. Biggest Drop: New York Yankees (5-6) The Bronx Bombers have dropped from 7 to 13 this week. Yikes. I’m sure that’s what a lot of people are thinking after all that noise about the Yankees Dynasty returning this season, only to watch them hover around .500 in the first two weeks off the season. Their offense is doing their best to live up to expectations but a lot of runs have to be scored in order to make up for a Team ERA of 4.33. Better luck next week, Yankees. More Notable Movement: Is anyone else as excited as I am to see a successful 2 way player in baseball? Shohei Ohtani and his new team, the LA Angels have jumped 5 spots this week after starting the season with the same record as the World Champions. The Amazin’ Mets have also made a significant leap this week from 9 to 5, after a 9-1 start that is tied for the best in baseball. On the opposite end, the two teams most people expected to own the National League, the Dodgers and Cubs have both dropped significantly after starting the season 4-6 and 5-5, respectively. Houston Astros (9-3) ⇔ They say that the best cure for a hangover is to keep drinking right? So I guess the cure for any World Series hangover would be to just keep on winning right? That’s exactly what the Astros are doing. We all know how much of a pain their line up can be for the opposition, but it is their pitching that is carrying them to this level of dominance. Their 2.02 Team ERA leads all of baseball by nearly 50 points. 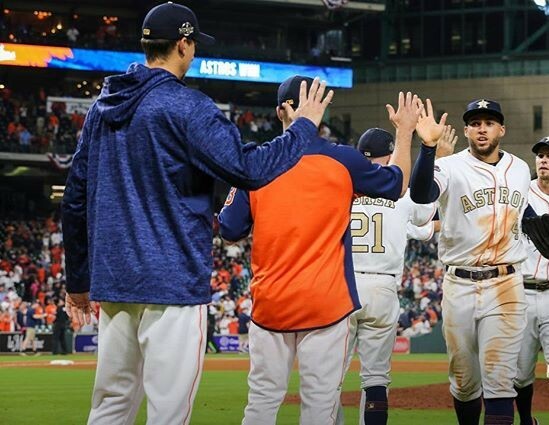 With a full season behind Justin Verlander, former Cy Young winner Dallas Keuchel, and newly acquired Gerrit Cole, this pitching staff could be a problem for opposing hitters all season long. Boston Red Sox (9-1) ⇑(3) We’ve come a long way since huge blown lead on opening day for the Sox. Since then, the Red Sox have been the hottest team in baseball, winning nine in a row. Their good fortune is due in large part to their 2.53 Team ERA that ranks 2nd in the AL and third overall in the majors. Their offense isn’t bad either. Their .259 Team Batting Average is the second highest average in baseball behind only the Angels and Pirates who both have a .286 Average. After blowing out the Yankees 14-1 to open up their season series, it looks like the reigning division champs are still the team to beat in the AL East. Washington Nationals (6-5) ⇓(2) The Nats have gone 2-5 since starting the season 4-0, but they still can’t be ignored. Their Ace, Max Scherzer holds a .90 ERA and has struck out 27 batters in 20 innings of work. Their phenom, Bryce Harper leads the majors in home runs with 6 and in OPS with a whopping 1.408. With the Mets playing at a high level to start the season, the Nationals might not have as much of a cushion in the NL East this year, but for now, they are still the best team in the division. Cleveland Indians (6-5) ⇔ It appears the Tribe is still getting their sea legs under them, but we know what this team is capable of, so I won’t move them out of the top 5 just yet. Their pitching is doing just fine with a 2.99 Team ERA and an opponent’s batting average of just .214, but their offense is really struggling. They are last in the league with a .158 Team batting average. But I have a feeling Francisco Lindor, Jose Ramirez and Jason Kipnis will start to play up to their expectations soon. New York Mets (9-1) ⇑(9) It’s Amazin’! Sorry, I just feel obligated to use the word “Amazin'” anytime the Mets are doing good. Seriously though, these Mets don’t need to be overlooked. Their 9-1 record puts them at the top of the National League and has them sharing the top of the whole MLB with the Red Sox. This homegrown rotation seems to finally be healthy (for now), and their offense is bringing enough people home to outscore the opposition. Their Team ERA of 2.61 is second in the NL only to the Dodgers and if this staff can stay relatively healthy, that number might not get any lower, which is very scary.